As Japan marked the 71st anniversary Monday of its surrender in World War II, people at two memorial sites in Tokyo expressed a wide range of views on the war. 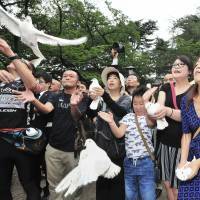 Many visited Chidorigafuchi National Cemetery in Chiyoda Ward to renew their plea for the current peace to be preserved. Others, meanwhile, visited the war-linked Yasukuni Shrine, also in Chiyoda Ward, which was holding its 30th national memorial ceremony. 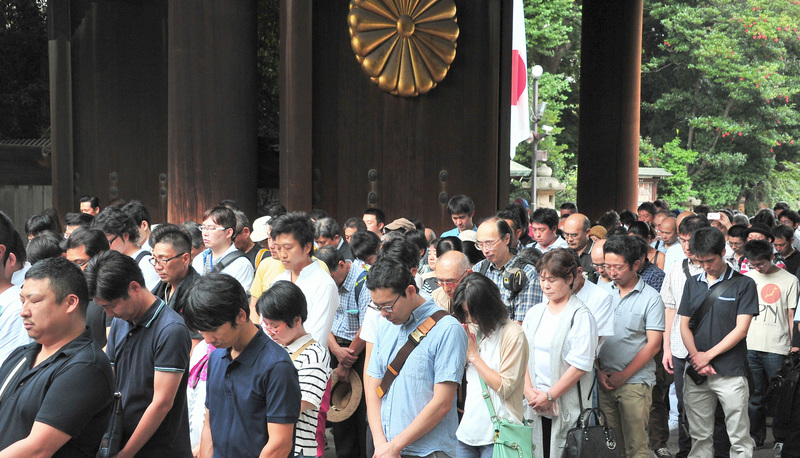 The Yasukuni event’s organizer, Eirei ni Kotaeru Kai (Group to Honor the Souls of the War Dead), expressed its wish for Prime Minister Shinzo Abe to visit the controversial Shinto site. “Last week on Aug. 8, the reigning Emperor gave a message to the people that he desires to abdicate before his death. According to an opinion survey, more than 80 percent have answered that they can accept his abdication,” said Taizo Terashima, president of Eirei ni Kotaeru Kai. He said the abdication should happen as soon as possible, but cited obstacles such as amending the Constitution and the Imperial House Law, even though no changes to the Constitution would in fact be necessary. He noted, however, that it would not affect the group’s earnest desire to have the Emperor visit Yasukuni. “For that, the Diet members themselves should visit Yasukuni Shrine, which requires the prime minister, the top member of the Diet, to come himself in order to make the practice standard,” Terashima said. During his first stint as prime minister, Abe did not visit Yasukuni, and although he did visit on Dec. 26, 2013, he has not been back. “In recent years, both China and South Korea have declared a war on history with us, blaspheming the souls of the war dead and trying to bring Japan down with the Nanking Massacre and issues related to ‘comfort women,’ ” Terashima said, referring to women forced to work in Japanese military brothels before and during the war. He added that Japan is losing this conflict because the prime minister is avoiding Yasukuni. Abe chose again this anniversary not to go there in person, though he made a ritual cash offering via a proxy. Honored at Yasukuni are some 2.46 million war dead as well as several Class-A war criminals. 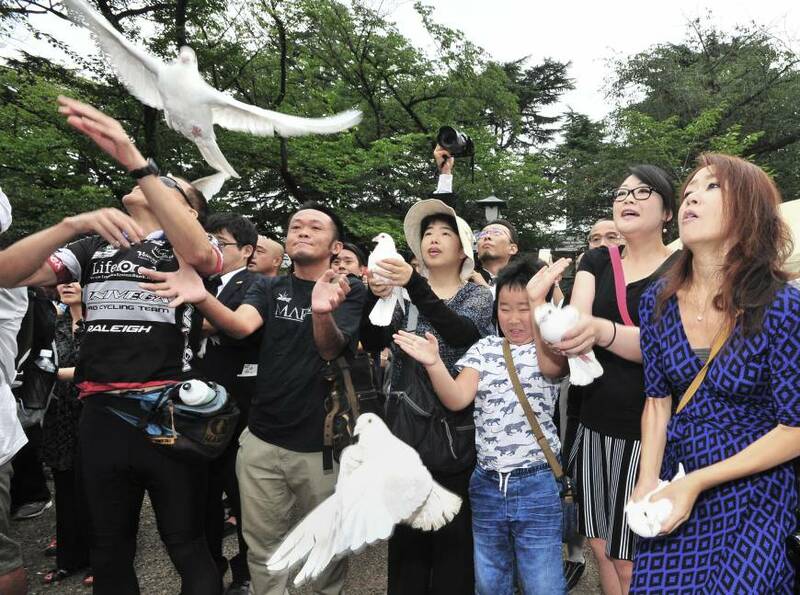 Many Cabinet members, including new Defense Minister Tomomi Inada, also chose not to visit the shrine, apparently to avoid offending China and South Korea. Meanwhile, not far away, many people made their way to Chidorigafuchi National Cemetery, which honors unidentified Japanese war dead. Opened in 1959, the cemetery is located just outside the Imperial Palace, a few minutes walk from Yasukuni. Its role, unlike the controversial Shinto complex, is more symbolic. It is the resting place of 364,896 unidentified soldiers. Setsuko Takahashi, 78, was about 7 when her father left to fight in the Philippines. Now, she brings photographs of her family members who, having passed on, can no longer pay tribute. Takahashi remembers the day the family saw her father off to the front, and recalled tearfully how later they received a box containing no bones, no remains and no belongings of her father. “I hope we can continue to live in peace,” she said. 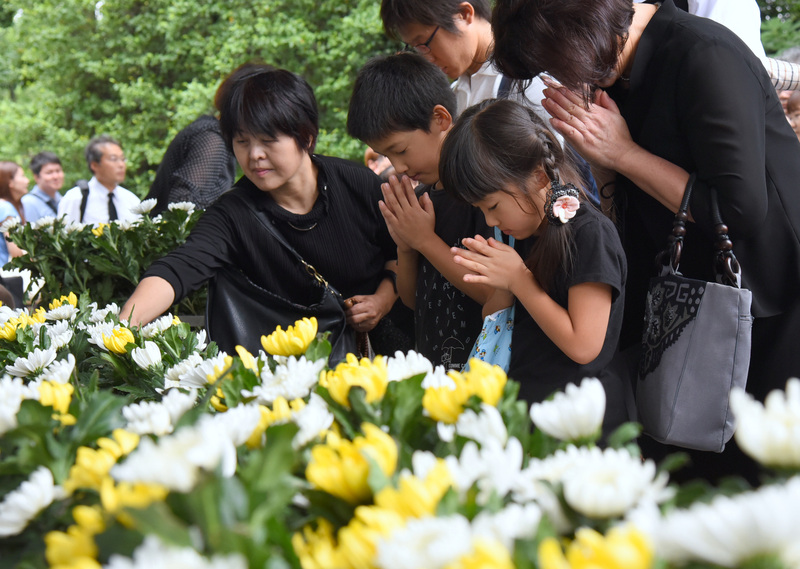 Sonoko Horie, 63, of Tokyo, used her day off to find the place where her uncle is believed to be buried and offer prayers. 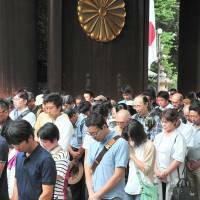 Railway company workers Shun Nishikawa, 28, and Koji Yoshida, 32, visited both Yasukuni and the cemetery to get a better understanding of the people paying tribute, including those who were there to pray for war criminals. The two often protest in front of the Diet, and strongly oppose war. “We came to learn what kind of country Japan has become,” Nishikawa said. “We wanted to know why people come here,” Yoshida added. For others, Prime Minister Shinzo Abe’s drive to amend the Constitution’s war-renouncing Article 9 is understandable and necessary to protect the nation. The Constitution is “wonderful and has noble content, but we can’t trust the surrounding countries,” Tetsuji Asano, 60, said near the cemetery. Asano believes that, given the challenging times and ever stronger threats from overseas, revising the Constitution is inevitable. Ikuko Aizawa, 78, from western Tokyo, said she doesn’t know where her father fought or where he died. “Presumably, he was hiding until the last days,” she said, recalling how, when she was a high school student, her family was notified by Japanese authorities that her father, believed missing since the war’s last years, was declared dead. He went to war when Aizawa was an infant, and she doesn’t remember his face. She said she comes to the cemetery each year to show her father that she’s doing well. This year, she brought her granddaughter, 13-year-old Hana. Aizawa believes Abe’s bid to amend the Constitution would serve to protect Japan. Interpreting such a move as leading Japan to war is short-sighted, she said. Tokyoite Yukiko Hasegawa, 75, said she would welcome an appropriate amendment. “It has been around 70 years since the war ended and I think no one wants to make the same mistake again,” she said. For Hasegawa, paying tribute to the soldiers is an obligation. 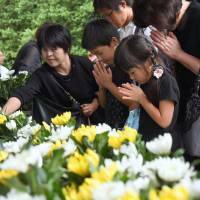 Her relatives who fought in the war died after returning to Japan. She visits Yasukuni Shrine and the cemetery several times a year, including when the cherry blossoms are in full bloom.